Ritigala - Kekirawa. - Locations in Sri Lanka. At 766 m above sea level, and 600 m above the surrounding plains, Ritigala is the highest mountain in northern Sri Lanka. The modern name Ritigala is derived from the ancient name Arittha Pabbata (Dreadful Mountain), mentioned in the Mahavamsa. Ritigala mountain range consists of four peaks of which the main and the highest peak at the south of the range is named Ritigala Kanda. Ritigala mountain range, a 3776-acre (1582 ha) Strict Nature Reserve, in the Dry Zone of Sri Lanka, is managed by the Department of Wildlife of Sri Lanka together with the Forest Department of Sri Lanka. Ritigala Kanda rises to an elevation of 2513 feet, higher than the other main tourist attractions of the north central plains, namely Sigiriya, Dambulla and Mihintale. The significance of this topographical feature lies in the abrupt sheerness of the massif, its wooded slopes and wet microclimate at the summit. During the North East monsoon (December to February), Ritigala experiences the highest rainfall (125 cm) of entire dry zone. The wet micro climate at Ritigala is a singular occurrence in the north central plains, the ancient Sri Lanka’s “Wewe Bandi Rata” meaning “the land of rainwater reservoirs” in Sinhalese. The climate at the summit is in sharp contrast to the climate at the foot; it is cooler in comparison to hot and dry climate of the region. Its rainfall records the highest in the whole of dry zone surrounding it by a good margin during the northeast monsoon of dry zone of the tropical island of Sri Lanka. The mist and cloud cover which encapsulate the summit during the south-west monsoon of Wet Zone of the island, results in high vapor condensation, in turn, turning the earth moist when the plains all around are in drought. Legends abound on Ritigala. One of mysterious aspect is the belief of powerful medicinal herbs found near the crest. A herb called “Sansevi” is believed to have the power of conferring long life and curing all human pain. According to legend, all vegetation on Ritigala is protected by Yakkas, the guardian spirits of the mountain. The venerable Prof. Walpola Sri Rahula Maha Thera (1907–1997), a Professor of History and Religions at Northwestern University, a Buddhist monk scholar, in his “History of Buddhism in Ceylon, says "the term “Yaksa” denotes superhuman beings worthy of respect. It is possible that it was applied, by an extension of meaning, also to some pre-Buddhistic tribe of human beings, aboriginal to Ceylon". The legend has it that Prince Pandukhabaya (3rd century BC) was assisted by Yakkas during his battles against his eight uncles at the foot of Ritigala. Another legend refers to a duel of two giants, most possibly Yakkas, named Soma and Jayasena. Soma being killed in the duel, Jayasena became a legend. According to popular belief, non-human Lord Hanuman of supernatural powers, traveled over Ritigala, and, by accident, dropped a chunk off a mountain of the Himalaya range he was carrying from India to Lanka for its medicinal herbs. Lord Rama's brother, Prince Lakshmana was mortally wounded in battle and only a rare herb in the Himalaya could save his life. The pocket of vegetation of healing herbs and plants at the strange mini-plateau at the summit of Ritigala, which is distinct from the dry-zone flora of the lower slopes and surrounding plains at Ritigala, could thus be accounted for. The ruins of Ritigala monastery are located on the eastern side of the mountain at the foot of the gorge which separates the main peak from the northern ridge of the range. The ruins cover an area of 24 hectares (59 acres). The monastery precinct begins at the office of the on-site branch of Department of Archeology of Sri Lanka close to the foot of the reservoir named Banda Pokuna. The ancient man-made reservoir is a feat of engineering with a bund of polygonal plan completing a circumference of 366 meters. The construction of the reservoir is credited to King Pandukabhaya (437 -367 BC). The reservoir possibly served a ritual bathing purpose, with visitors bathing there before entering the monastery. The order of ritual bathing tank, ruins of entrance complex and a pedestrian path seem to indicate devotees in large numbers visiting the monastery. The procession is similar to that of Kataragama where pilgrims begins with a cleansing bath at Kataragama Manik river and end with an offering to the God Skanda, the benevolent Hindu deity of Kataragama at the main shrine. The edge of the reservoir is followed in a clockwise direction to arrive at the other bank, and cross the bed of the stream feeding the reservoir. The steep steps here onwards lead up to a beautifully constructed pavement, a stone path 1.5 meters wide that meander upwards through the forest, linking the major buildings of the monastery. The stone cut path is laid with interlocking four-sided slabs of hewn stone. Three large circular platforms at intervals along the pavement allow for rest. 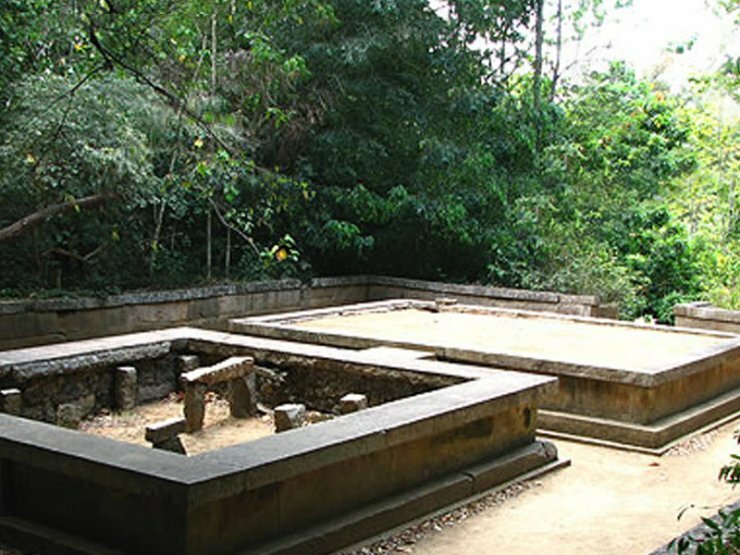 There are stone structures named double-platforms, which are characteristic of Ritigala and other forest monasteries such as Arankele, Veherabandigala and the western monasteries at Anuradhapura. Spread over an area of about 120 acres are about 50 such double platforms. Raised platforms formed by retaining walls of massive stones are found in pairs, linked together by a stone bridge. The main axis of the combined platforms is set exactly east west. The structures were then most possibly roofed and divided into rooms. These are believed to be used for solitary practices such as meditation, as well as congregational functions such as teaching and ceremony. Over a stone bridge lie interlocking ashlars and the ruins of a monastery hospital, where the medicinal herbs-leaves and roots-grinding stones and huge stone cut Ayurvedic oil baths can still be seen. The pavement continues straight ahead to reach one of the roundabouts. About 20 meters before reaching the round about, a path heads off to the right, leading through enormous tree roots to a lookout, reached by a stone high above a burbling stream. Further up is another lookout. Then is found an artificial waterfall contrived by placing a stone slab between two rocks. Another 500 meters and two further sunken courtyards are seen. The first courtyard contains a large double platform structure, one of the largest stone structures in the entire monastery; one of the platforms preserves the remains of the pillars which once supported a building. A few meters beyond lies the second courtyard and another large double platform. With the exception of a few broken granite Buddha statues in a number of caves, Ritigala has none of the traditional icons of Buddhist temples: no bodhi tree, no stupas. The first Lanka Vihare (temple) was founded near Ritigala at the foot of the mountain in the second century BC. The Aritta Vihare was founded a century afterwards. Royals proved generous patrons. In the ninth century AD, King Sena made endowment of the monastery, a larger complex higher up the slope for a group of Buddhist ascetics called the Pansukulikas (rag robes) monks who devoted themselves to extreme austerity in search of supreme enlightenment. Such was the detachment of these Buddhist ascetics from the traditional life of Buddhist monks at village temples, their robes were simply cleaned, washed and repaired rags, mostly shrouds picked up from cemeteries, in line with one of the thirteen ascetic practices (Dhutanga) outlined in Buddhism.